2 bed / 2 bath ground floor apartment in a residential development with swimming pool in Palomares. 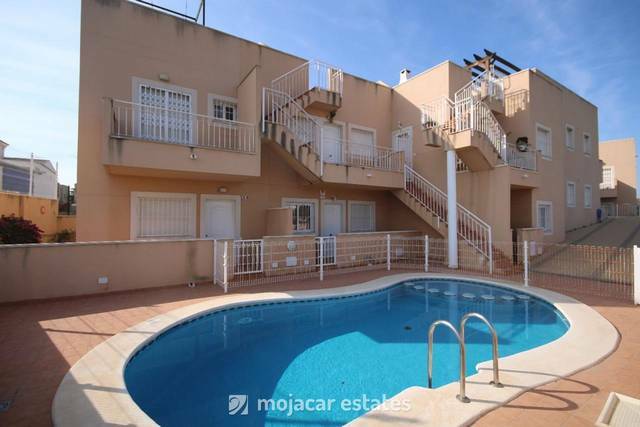 This well presented two bedroom apartment is situated in the coastal village of Palomares. The beach is around a kilometer walk and the village just 400 meters. The apartment has a built area of 60.36 mts2 which briefly comprises of a large living / dining area with an open plan fully fitted and well-equipped kitchen, master bedroom with an en suite bathroom, a further double bedroom and a family bathroom. There is also a large 20.56 mts2 private back terrace and an 9.90 mts2 underground parking. The complex is fully gated, has a communal swimming pool and the sea can be reached on foot. The property benefits from air conditioning throughout. The property is also has great rental potential for both short and long-term tenants. At the current price we are expecting a high level of viewings. For more information or to book a viewing appointment please visit our office or contact us by phone or e-mail.